Traveling in April is supposed to be, well, springy like weather, right? A late spring blizzard made me a day late to the North Central McGown Teachers Workshop in Dubuque Iowa! 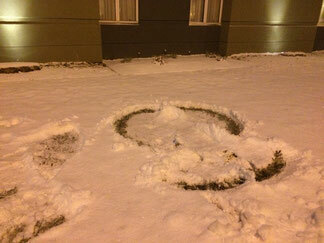 We made snow angels one night after the second storm of the week! 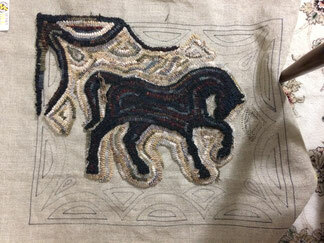 I am making progress on a primitive rug from a class at the workshop. Wide cut, primitive representation taught by Valerie Bergeman. Excellent class.